Modern tourism in Positano began to develop after the Second World War, first with the Germans, who had military headquarters here, then with American and English troops, who landed in Salerno. 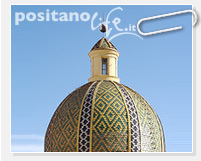 But tourism in Positano goes back many centuries. After the visit of the Phoenicians, who were seafaring colonizers, the first documentary evidence of Positano's role as a resort dates back to the time of Posides. First a slave and then a freedman, he became a famous architect in Tiberius' Rome (or, according to some historians, during the era of Nero) and built the first tourist facilities here on the Coast. The following story is told in Positano: the architect Posides built a palace for Tiberius on Capri, who settled there in 27 A.D. The emperor had many villas along the coast, where the members of his court stayed. They include: Villa Pollio on the coast to the east of Sorrento, the imperial palace on Capri, a villa in Positano, located beneath what is now Piazza Flavio Gioia, and other villas in Amalfi and Minori. Not all of these can definitely be attributed to Posides and many others have disappeared, but it was definitely he who built a magnificent villa near the beach in Vico Equense for the infamous imperial traitor Seiano, the prefect for whom the area is named. All traces of the villa seem to have been lost, even though there is evidence of buildings previous to this period, dating back as far as the VII century B.C. Posides seems to have had almost unlimited energy - the various ruins currently being recovered amount to only a few of the buildings attributed to him, which almost certainly include the mill at Arienzo, where the Roman ships unloaded wheat to be milled for Tiberius. The flour was then used to make bread at Fornillo ("little bakery"), from which the Positano neighborhood takes its name. The area that the Romans referred to as Campania Felix was devastated by the eruption, in 79 A.D.., of a hill that until then had been cultivated with grapes and olives. It became what we now know as the volcano Vesuvius. In addition to destroying Pompeii and Herculaneum, the volcanic material that rained down on the area also fell on Positano and the Amalfi and Sorrentine coastlines, covering many inhabited areas, which were then abandoned. When archaeological excavations were later begun, one of the greatest difficulties encountered was that, over the centuries, the volcanic material had solidified at many of the sites, making the work very difficult. It is astonishing to think that these ruins have in a certain sense returned from the past and, in areas like Pompeii and Herculaneum, taken on their former roles as drivers of the local economy, now based on tourism, just as it was many centuries ago. The eruption of Vesuvius was not only a local tragedy in terms of life lost. It marked the end of a flourishing era. Many centuries would pass before Positano, for example, would again become a popular destination. At times, it seemed almost to have disappeared entirely; at other times it enjoyed a brief resurgence. But certainly, both mass- and elite tourism, as we now understand it, was unknown in the past and the only visitors of any note were religious, pilgrims visiting the various local sacred sites. Vesuvius changed the entire area much more than is often understood.